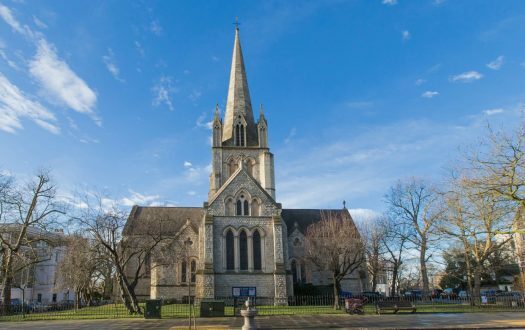 Designed by Victorian Gothic Revivalist and champion of the Oxford Movement William Butterfield, the church dates from around 1860. The tower and its foundations are all that remain of Butterfield's building, however, as World War II bombs took their toll. 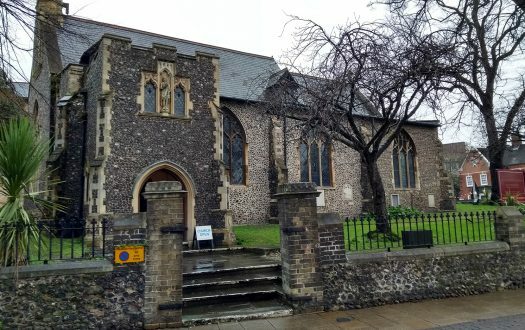 The chapel, added in 1891, is by the late 19th/early 20th century architect Charles Henry Money Mileham and features stained glass by Charles Eamer Kempe; it also survived the bombing. The post-war main church, restored in 1959-1961, is notably lofty but, unlike the tower, quite plain inside, with pale stone and vaults. It was designed by two Gilbert Scott brothers: Adrian and Giles of the famous Gilbert Scott dynasty of architects. What marks it out inside are the murals of Hans Feibusch, a German Jewish artist who escaped Germany just in time  the rest of his family perished in the Holocaust. Converted to Christianity by Bishop Bell of Chicherster, Feibusch became a specialist in church murals. 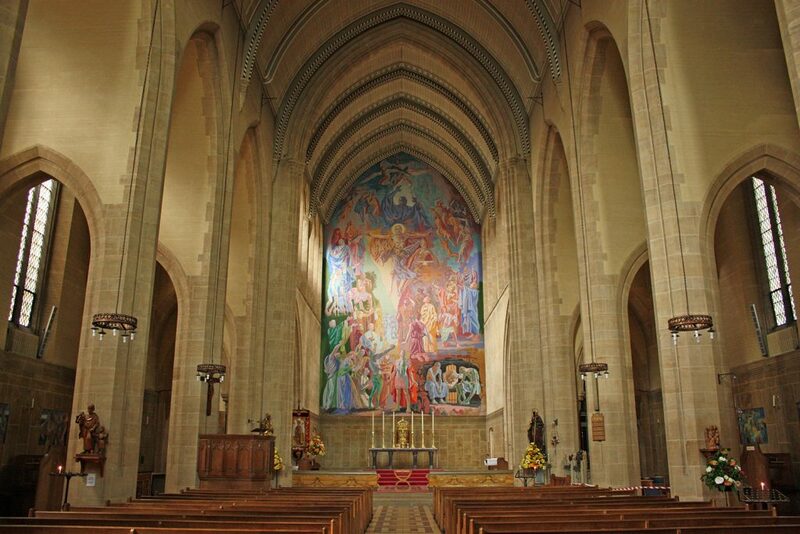 St Alban's hosts his largest work: a mighty depiction of the Trinity in glory that rises 64 feet above the high altar. It has lots of powerful German Expressionist colour: pink set against orange, for example. 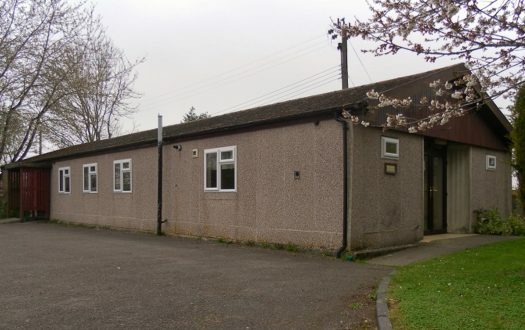 The birthplace of Affirming Catholicism  a group that sought to reconcile Anglo-Catholic tradition with progressive churchmanship on such issues as women priests and attitudes to human sexuality  St Alban's has since reverted to being a Forward in Faith parish  that is to say, conservative on such issues and operating under alternative Episcopal leadership of the Bishop of Fulham. Holborn was once the site of notorious slums and St Alban's founders were celebrated as famous exemplars of "slum priests." One hundred fifty years later, the parish includes banks and legal offices as well as the council flats that have replaced the slums. St Alban's Church is tucked away up a side street, off High Holborn. Alban, a youthful Roman soldier and first martyr of Britain, probably walked along High Holborn nearby, via what is today Marble Arch to Verulameum (today St Albans) where he was martyred. The preacher and celebrant was the vicar, the Revd Christopher Smith. He was supported by an altar party of eight. Twelve clergy sat at the front, but in the congregation, for this patronal festival mass. Lots of red festal silk. The Solemnity of St Alban the Martyr. A congregation of 70, 20 clergy, and the altar party and choir. Though it has a soaring interior, St Alban's is not a large church, so it felt quite full. A greeter bade me welcome, smiled, and handed me the service sheet and hymnal. Not quite. The back was at the wrong angle. But I still prefer pews to chairs, and once I got used to slouching a bit on this chunky oak job, it became comfortable. Pews are generally much more friendly for the infirm and doddery than chairs: something to grab hold of, especially if you are moved to genuflect as you proceed to communion. A mixture of deep prayer and some quiet chat. Candles being lit all around, some servers hurrying to and fro. "I am called Alban." There then followed a station at the shrine of St Alban, a lengthy procession with banners by the altar party, while two hymns were sung. The congregation stayed put and watched. Then the mass began. New English Hymnal and a service sheet for the day. Organ  a mighty Compton instrument in a high west gallery. The loudness with which the organ was played. During the hymns I could barely hear myself sing, let alone anyone else. Right up the candle. Impeccably choreographed  dignified rather than fussy  and there was incense. Not just gesture incense, mind you, but full-on Anglo-Catholic festal miasmas of holy smoke. This hung in the air like the kind of thick fog I remember in London in my youth; we used to call them "pea-soupers." Even the vivid colours of Hans Feibusch's mural were dimmed by it. You either like this sort of thing or don't. I am a sucker for it. 7 – This was a dense sermon that packed a lot of theology of some sophistication. It was quite a challenging listen, but I prefer having too much meat in a sermon to too little. Taking grace as his subject, Father Smith tackled it through St Augustine, the Anglo-Catholic theologian Eric Lionel Mascall, and others. The main take-away: "Grace does not destroy creation, but completes it." The choir sang a mass setting by Gounod: his Third Solemn Mass. This is a wonderful piece of devotional music, passionate and winning. They were in the west gallery out of sight, but I would guess there were just six singers who filled the lofty church with a glorious sound  when we could hear them over the organ, that is. It must have been so dispiriting for those singers. The parts when we were swamped by organ. As the psalm of the day put it: "Yea, the waters had drowned us, and the streams had gone over our soul." No chance  we we all invited to share a festival buffet and drinks. There were directions from the vicar and from the lady who was stacking up hymn books at the back. The spread looked nice and there was wine plus various soft drinks  but I had already eaten, and since the mass had gone on for almost two hours, I needed to head for home. I guess there was coffee as well, since the catering seemed to address all tastes  but I couldn't stay. 6 – I don't share this parish's Forward in Faith views, but may well return occasionally for the music and solemnity.